Just One of the Groomsmen by Cindi Madsen introduces Addison who’s always just been one of the guys, until one of her friends comes back to town for a wedding and realizes she’s the perfect woman for him. Check out the cover reveal the contemporary romance here! Cindi Madsen is a USA Today Bestselling author of both contemporary romance and young adult novels. If you’ve never read any of her books before, you should know that they’re not only well written but also incredibly hilarious. Just One of the Groomsmen sounds like it will be another hit from Cindi Madsen as it tackles the age old problem of a girl that’s surrounded by all guy friends, and what inevitably happens when an attraction to one of them comes in to play! Read more about the book below and see the exclusive cover reveal! Addison Murphy is the funny friend, the girl you grab a beer with, and the girl voted most likely to start her own sweatshirt line. And now that one of her best guy friends is getting married, she’ll add “groomsman” to that list, too. Her boys mean everything to her, so she’ll get through this wedding if it’s the last thing she does…even if it means doing so in heels. Just don’t ask her to dive for any bouquet. Tucker Crawford is finally back in his small hometown for his best friend’s wedding. Color him gobsmacked when he starts to notice “one of the guys” in a whole new light. If he convinces Addie to give him a chance, they could be electric…or their break-up could split their tight-knit group in two. Keeping the way he feels on the down low from the rest of the guys through bachelor parties, cake tastings, and rehearsals is one thing. But just as it dawns on Tucker that Addie truly could be the perfect woman for him—he was just too stupid to realize it—now she’s leaving to follow her own dreams. He’s going to need to do a lot of compromising and a whole lot of groveling if he’s going to convince her to take a shot at forever with him—on her terms this time. 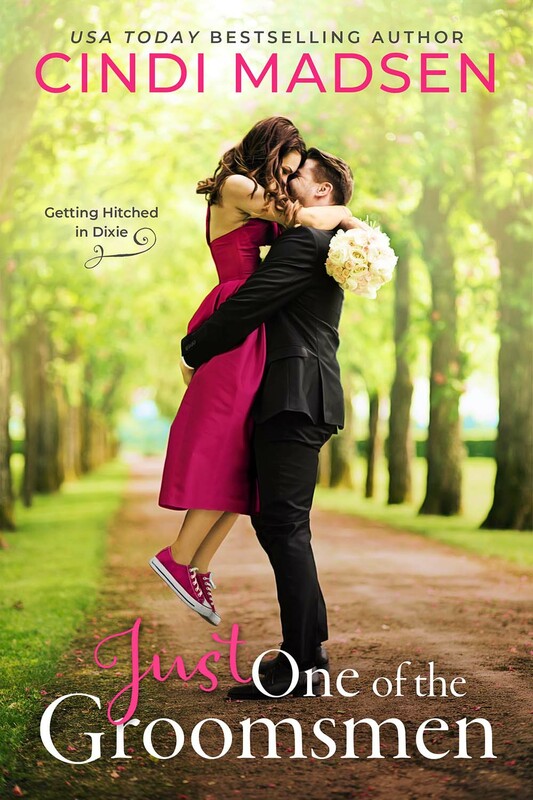 Just One of the Groomsmen by Cindi Madsen will be released on May 28! Pre-order now from Barnes & Noble, Amazon, or iTunes! And don’t forget to add it to your Goodreads!